In 1967, George Romero gathered a handful of Pittburgh's industrial film and TV commercial producers — they all wanted to make a movie. A horror film seemed like the right idea to them, and with a half-written script, they secured a house scheduled for demolition, clothes from goodwill, buckets of chocolate syrup, and various pieces of flesh from a local butcher. The scrappy, gory, black-and-white movie they made is a landmark of horror films, and created the zombie genre. 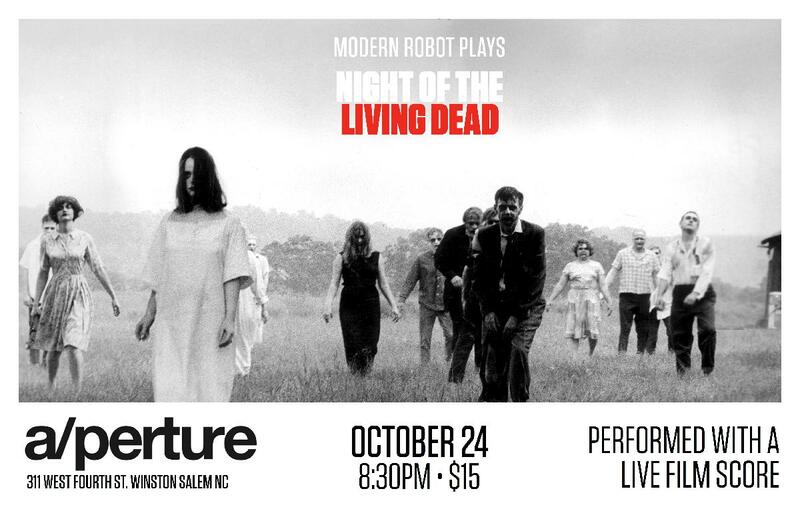 This showing is a new look at Night of the Living Dead. Ben Singer has re-edited the soundtrack, composed a new film score, and will perform the music live, accompanied by drummer Nicholas Falk. When Ben Singer began working on a show based on George Romero's Night of the Living Dead, it was for the kitsch and cult factor. In 1968, this movie was wildly gory. What he found was a different kind of movie, one that was more about human frailty, distrust, and the racial prejudice we still fight with today. Modern Robot is Ben's project combining film and live music. Sometimes the films are classic silent films, like Murnau's "Faust", which was reviewed in BroadwayBaby as "astonishingly powerful exhibition of musical talent" and "a pulsating, breathtakingly epic score to the film". Modern Robot's "Faust" was performed at Fringe festivals in Edinburgh, Orlando, San Francisco, and New York, where it won the overall excellence award for music composition. But with "Night of the Living Dead", Ben created a version that had the essense of a modern movie, carefully editing to keep dialog and foley, while stripping away the original, stock music. Ben's new film score has the big, post-rock texture of electric guitar and drums, and owes much to Philip Glass's introspective minimalism and Nino Rota's expansive melodies. Ben Singer lives in Greensboro, NC, where he performs as a singer/songwriter and a band member on piano, guitar, and drums. Along with live film scoring, Ben has composed and performed music for for plays, short stories, podcasts, book readings, folk musicals, and aquatic dance.